Some users will be able to see more than one location in the Scheduler. This is either because they have manager rights across multiple locations, or because they have been given read only access to other locations close by their store. Read only access allows managers to view staff availability in nearby locations, which is helpful for identifying available colleagues to provide cover when a particular store is short staffed. Use the check boxes to select which location(s) you want to view. If you want to re-order your locations, you can move them around the list by clicking and dragging them into place. The first location in the list is the default location which means it will load first in the scheduler by default. You can select all or de-select all by clicking the three stacked dots icon next to Locations. If you have access to multiple locations, you can use Gaps to find cover for your store from another branch. Gaps across multiple locations works in the same way as across a single location - the only difference is that you can send the available shifts to multiple employees and view availability in other stores when you're choosing who to assign a gap to. An employee staffed to work, for a one-off shift, in a store that is not their normal 'home store', will show on their 'home' rota as working in that other store. The hours they are working in the other store will count towards their working week. The shift is 'locked' to the manager of the home-store location, since the shift itself is on another manager's rota. For a reminder on how to use the Gaps feature, check out our Gaps article here. 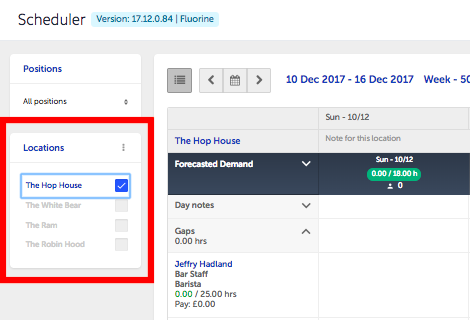 If you use Gaps to staff someone from another location for a shift in your store, and afterwards run the Autoscheduler to produce the rest of your store's rota, it will take into account the work 'already being done' by the employee you have borrowed. If you have lent a staff member to another store via one of their Gaps, you'll also see the locked shift that they are working elsewhere, and the hours towards their Contract Hours that this shift already accounts for before you give them any shifts in your store. When you run the Autoscheduler for your store's rota, it will take these things into account in allocating shifts to the lent employee. Running the Autoscheduler will not undo or change the shift. Note that you cannot use the Autoscheduler to create Gaps for you or to schedule someone from another store automatically. These shifts always have to be created and assigned manually (either before or after you run the Autoscheduler).